It’s not easy being green. 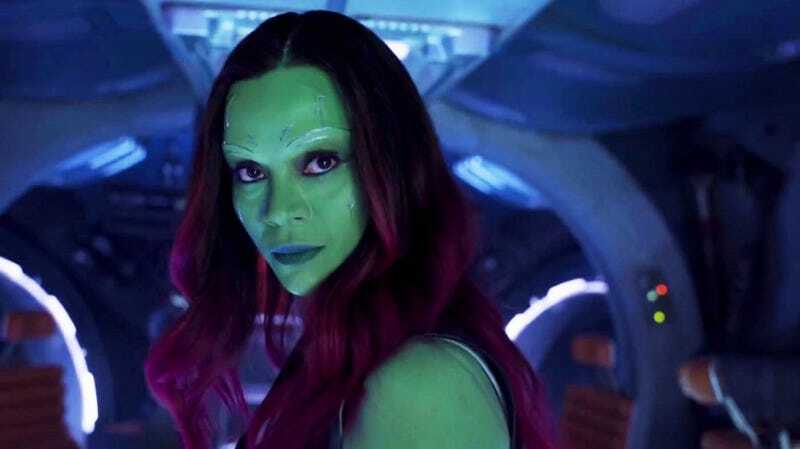 Guardians of the Galaxy 2 star Zoe Saldana is giving fans an inside look at what it takes to transform into Gamora for the film. Spoiler: It involves a lot of waiting. Saldana shared a time-lapse video on Twitter condensing her three-hour makeup session into a 38-second montage of sitting and staring into space. It’s definitely not as long as specialty makeup sessions for other films, but it’s still a hell of a long time. Definitely longer than putting on a few dots and some headgear for shooting Avatar. Makeup and prosthetics can turn out some dynamic and gorgeous characters, but the process it takes to transform people into otherworldly beings is daunting as hell. For example, Mystique’s full-body makeup and prosthetics took between eight and 10 hours for Jennifer Lawrence and Rebecca Romijn in their respective X-Men films (before Lawrence switched to a full-body suit). Then you’ve got the Lord of the Rings series, which is in a world of its own— more than 1,600 customized prosthetic ears and feet for that one.